Digital marketing is constantly evolving in technology, marketing strategies, and tactics. It is a challenge to keep up. To gain insight into the shifts and up-and-coming technologies we asked 10 marketing experts to share their thoughts on the transformation and future innovation in MarTech and marketing. For marketing technology to translate into transformative experiences the industry must look not to the past, but to a future of disruption. This future is not without its uncomfortable challenges, it requires us to embrace the power of new behaviours, technology and opportunities, rather than treat this change as we have – something to digest. We consider ads to be set images, but they need not be. If an ad is a series of instructions that pulls you through content in real time, ads can be formed by API (application programming interface) instructions that serve personal, context-specific, real-time ads for that moment. Trains running late – why not try an Uber? We need to think of ads as constructions of data, not “ad copy”. The internet will slowly morph, so everywhere will be one click away from a purchase. Soon our banking/credit-card details, shipping address and fingerprints will be embedded in phones and computers; one click to buy from ads, social content and TV shows will be the way forward. It will bring about massive changes to how advertising is seen. As all screens are digital, motionless advertising makes no sense, but, similarly, our shorter attention spans means ads should also be far shorter. Flow advertising will be a new way to think about how messages can build. Advertising can build stories across screens and devices, stories can be told sequentially with different units. Messaging can move people from brand to product to purchase over a matter of days or even years. We are now in the era of Automation 2.0, where the marketing automation platforms are no longer the only place automations happen. 3. automate the execution of experiences across a web of applications. 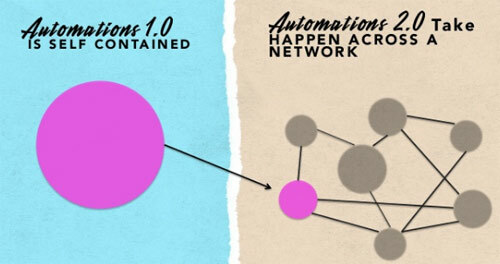 The marketing automation platform is now simply a node in the network, not the central processor of automations. With this new connected network, AdRoll increased its sales team appointments 13%. Best-in-class marketing organizations use 14 tools on average. Creating cohesive customer experiences requires integration and automation across dozens of channels, data sets, and applications. Experiences, not messages, are the future of marketing, and growth hacking is the discipline of using data and testing to create optimal experiences. Because of the variances in tools, data structure, and workflows, only an Automation 2.0 framework of a web of data and tools can support this future. Marketing automation 1.0 is the tool of choice for the demand-gen/lead-gen expert. A network of data and connected tools are creating an Automation 2.0 environment, which is the choice of the growth hacker. Mathew Sweezey is principal of marketing insights at Salesforce.com, and author of Marketing Automation for Dummies. First we change the technology, then technology changes us. But to be able to employ new tech in the day-to-day running of a company, it is important to see one thing: it is not about that technology itself, but about the changing behaviour of people under the influence of that technology. First we change the technology, but then the technology changes us. An example is the GPS in our car. When I had to drive in the nineties, I prepared myself the night before. I went to mappy.com, looked at the directions, printed them … If I go somewhere today, I don’t prepare: I just type in the address and my GPS gives me the directions right there. This information comes to me when I need it, without much preparation. The decision-making process of people has been thoroughly changed by the availability of (digital) information. Today, information is frictionless and we will first seek it out before we contact any supplier. It is therefore important to be present as early as possible and in the right way in that changing decision-making process. People don’t want to be sold to, but they DO want to be helped with buying. One of the major trends in retail is mainly seen in Fast Moving Consumer Goods (FMCG). The purchase on the basis of impulses the moment itself, shifts to subscriptions. • All kinds of clothing, to socks. • And most visible: subscriptions Food, meat or food substitutes. Or food recipes for a whole week like Smartmat or Hellofresh. Shopping for everyday goods is almost interface-free and very frictionless. The next step is for manufacturers of domestic appliances and electronics incorporating these controls into their devices. A good example is Poppy: a coffee machine that knows when your beans are almost finished, and automatically orders through Amazon. A serious impact on how companies should communicate to consumers. For brands, it is a different way of thinking. Marketing with technology, the channel might be the products and appliances in our vicinity we will have to change messaging (and MarTech) to accommodate. Bart de Waele is Infovore, saphiofile, gadgetfreak, pattern recognizer, Partner at Mandelbrot and CEO of digital agency Wijs. The era of BYOMT (Bring Your Own Marketing Technology) will soon be behind us. CTOs will once again play a central role in the choice of marketing technologies. For years several analysts have claimed that the CMO has more power within organizations than the CTO. However, they failed to see the growing complexity of marketing automation. This essentially relates to data; the availability, standardization, understanding, and protection … areas in which marketers tend to be poorly equipped in terms of their education and empathies. Benoît De Nayer is Founder & Director of ACTITO, Marketing Automation & e-mail Specialist, Digital Entrepreneur. Working in marketing and technology requires a lot of structure and planning without compromising on the freedom of creativity. We recently implemented scrum in our marketing department at Sleeknote, and I think that many companies are bound to go towards that way of working. We’ve seen a huge increase in efficiency and output. With Agile, you’ll have the ability to quickly run new marketing experiments, gather real-time feedback on their effectiveness and move closer toward your goal with each iteration. Scrum is the delivery approach, the framework that helps us get the right things done. 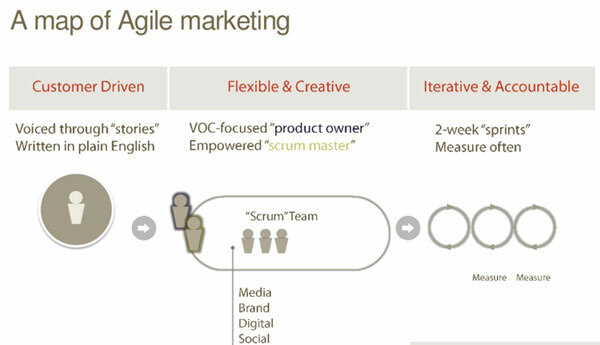 Scrum methodology begins with a project backlog, a list of marketing tasks developed by the marketing team to achieve the marketing goals. During the sprint planning meeting, the team reviews the project backlog and agrees upon the tasks to be accomplished during the current sprint. Completion of these tasks is tracked by the Scrum master, mainly through an online application, a weekly Scrum meeting and, if you’re using Slack, a weekly standup using Geekbot. When you work on bigger MarTech projects, you should definitely implement SCRUM. Think about projects like the implementation of new tools, large automation campaigns, or continuous improvement and conversion optimization. When you work in SCRUM, you’ll never find yourself drowning in work, and if you do, you’ll be able to review your sprint and figure out what to change in the next sprint to avoid stressing over too much work. My view on the trends in MarTech. Back in the early 00’s, we had simple tools and simple channels. Even email was simple subscribe + send email to list of subscribers. For a newsletter, that was perfect. But marketing became more complex. Managing paid search, SEO, email, and content became hard. With the advent of marketing automation a few years later (HubSpot, Marketo, Pardot, Act-On all launching in the span of a couple of years). “All-in-one” was supposed to save us. •	There’s less low-hanging fruit (the key traffic sources are all building pay-to-play walled gardens. •	There’s no room for mediocrity and imprecision when dollars are being spent for every move). So to counter this feeling of being overwhelmed, marketers use more tools than ever. Like a giant pharmacy, we live in the age of the MarTech 5000. Instead of wrangling all this complexity, marketers are drowning, tangled in their marketing stacks. Except it’s not a marketing stack. It’s a fRaNKeNsTaCk. No team on earth has successfully orchestrated their tools, teams, and data across the entire customer lifecycle In our research, we seek out “best examples” through our networks of practitioners and investors. Upon examination, it’s generally a shitshow… but some teams are taking steps in this direction. Challengers, please step forth! But what is clear – it is the role of marketing to step in and take ownership of this problem. Only marketing has the broad breadth of reach and interaction across the entire customer lifecycle (and therefore each team across that lifecycle). 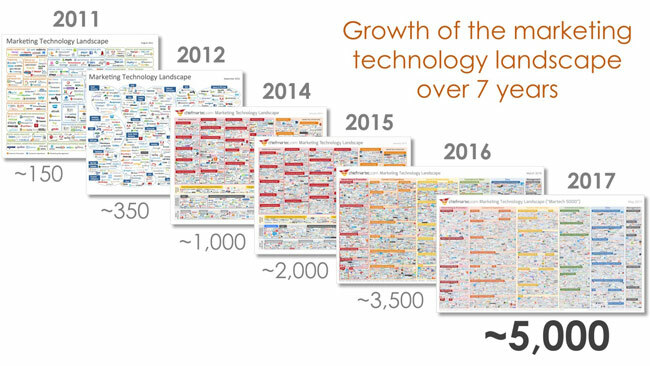 And because of the growth of martech, we’re the one’s with the disposable budget to solve. This is the challenge of our age. Fear the fRaNKeNsTaCk! My vision for Martech is we start using artificial intelligence to manage the core systems, such as the customer data platform and budget allocations. This is quite different from most AI applications to date, which have been things like chatbots and content optimization. Those solve very narrow problems but they rely on a core infrastructure being available for them to plug into. The infrastructure itself has so far been built and managed manually, and thus remains a major bottleneck. But AI will soon be able to do things like automatically connecting a new data source and adjust the customer database to use data from that source. This will remove the bottleneck and allow the narrow applications to take full advantage of all the new channels, data sources, and opportunities. It requires much more powerful AI and strong governance processes to ensure the AI doesn’t make mistakes. It further requires long-term performance measures, such as algorithmic attribution, that can guide the master AI system in making its judgments. I think of this as a robot supervising other robots: until that happens, the human supervisor prevents the robots from working as quickly and effectively as they can. David Raab is a widely recognized expert in marketing technology and analytics. Independent consultant and Founder at CDP Institute. The MarTech future will be about campaign orchestration, insight and relevance in the age of artificial intelligence. A number of Marketing Tech providers will try to grab the spotlight by offering machine learning services, surfing the peak Hype-cycle wave. So expect many vendors to add and improve features such as behavioral product recommendations and send time optimization. Advertisers want to do one-to-one personalization and they need software to do it at scale. On the outbound side, this means a broader use of automation, real-time recommendation engines, and individual newsletter send times. On the inbound side, I am curious to see if chat bots gain ground in the area of email management, too, which could relieve customer care. * Predicting churn or customer lifetime values. I don’t necessarily see that all this being covered by one MarTech company. But massive open online courses and data science platforms will push forward the democratization of data for more and more people. As the lines fade between different types of Marketing technology, ABM makes its entry into Marketing Automation platforms. Especially those that target the B2B audience. The trend is understandable after Account Based Marketing has been popularized over the last few years to the point that B2B marketers and sales teams are asking for specific functionality. Jordie van Rijn is an independant Email Marketing and Marketing Automation consultant, MarTech enthusiast and the founder of emailvendorselection. We need new approaches in email technology, who will be the first? The fundamental principle of email marketing is constant from year to year: Providing relevance for everyone in your audience. The changing landscape is the MarTech that enables strategies that were previously impossible or too expensive. Email automation, which doesn’t replace broadcast email due to its limitations, and behaviourally driven email content, are the current state of the art. So what next? How should technology and processes be re-imagined for the next evolution? 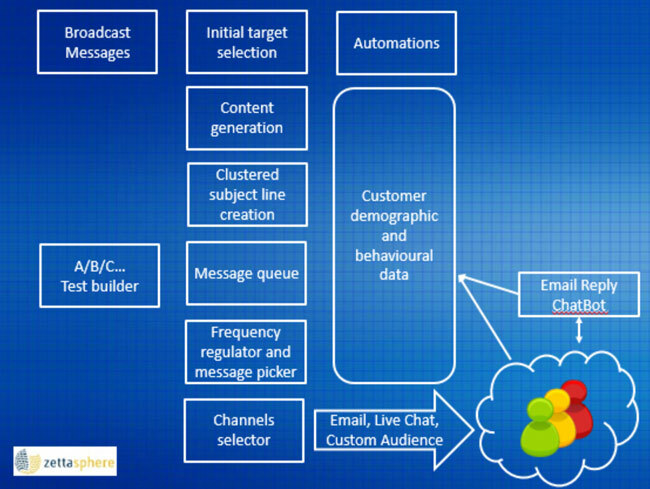 This is each part of the process in the blueprint for future of email marketing. Take the current technologies for predictive and AI driven content. Highly targeted content based on the individuals’ behavior, inserting products or content into the email based on what the contact has browsed or purchased. The current technical solution is using linked images to show pictures and text. Sounds smart? Well, it is. The only practical way to achieve relevance at scale given the huge diversity is to have computers that build emails for each person individually. But there is a problem. The subject lines are not keeping pace with the cleverness of the email body contents. Here’s a sample of subject lines used by eBay on their automatically created and personalized emails. Tim, we’ve gathered some of your favourites together. Notice anything? The subject lines are all very generic. There is no alternative, as they must fit with unknown body contents. The subject line is generated totally independently of what is put into the email body. Current solutions have placed a big Trump-size wall between email subject lines and body. Having copy in the subject line that gives clarity about body contents is not possible with dynamically linked images technology. The deal teasing subject lines above used by eBay are very inspired and varied. It’s quite amazing how many ways the same generic subject line message is written! But they could be used in any deal email. In fact, you can go ahead and steal them. What we need are great email body personalization and great subject lines. That will yield higher performance than current tech. This needs new approaches in email technology. Who is going to be the first technology vendor to create a solution? Tim Watson is Email Marketing Consultant and founder of Zettasphere.